Lots of features, low prices – but how does 1&1 IONOS perform? Founded in Germany way back in 1988, 1&1 IONOS is now Europe's largest website hosting provider, handling a mammoth 19 million domains spanning 70,000 servers in data centres across Europe and the US. 1&1 IONOS offers three general-purpose shared hosting plans. These start with Basic – £1 ($1.20) per month plus VAT for the first year, then £5 ($6.10) – which despite its name, has all the core functionality many buyers will need. That includes a free domain, unlimited webspace, websites or bandwidth, along with an SSL certificate, basic email (2GB mail storage only), automated installation of WordPress, Joomla, MediaWiki and many other popular apps, plus 24/7 phone support if you run into problems. The Plus plan – priced at £4 ($4.90) a month ex VAT for the first year, £7 ($8.55) a month on renewal – improves performance by caching your site content in servers around the world, and doubling Basic's RAM allocation from 600MB to 1.2GB. Access to 1&1 IONOS's SiteLock enables scanning your site for malware, security vulnerabilities, SSL issues and more. There's also support for up to 500 MySQL5 databases, up from only 20 with the Basic plan. The Pro plan – £7 ($.8.55) a month ex VAT for the first year, £10 ($12.20) afterwards – gives you 2GB RAM, 1000 databases, a smarter CDN and extended app support. 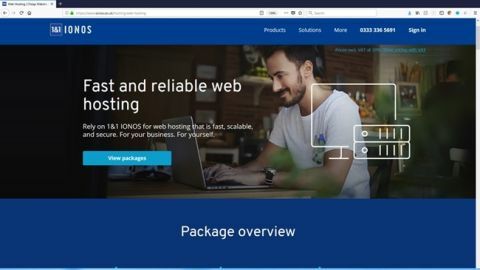 If you're looking for WordPress hosting then any of these plans will do, but 1&1 IONOS also offers some time-saving managed WordPress packages. These get you easier setup, preinstalled and recommended plugins, automatic security updates and improved support, all for the same price as the general plans. There are also specialist e-commerce packages which come with custom sites, product catalogues, a shopping cart, PayPal and Amazon payment support, and more. Prices range from £60 ($73) to £585 ($710) for year one, depending on the features you need. A 30-day money-back guarantee covers most of this, although there are one or two gotchas. In particular, you're not covered for new domain registrations and a customer can only use the guarantee once. Check the small print here. Setting up your 1&1 IONOS account involves several steps, but a well-designed wizard walks you through the process and keeps it relatively painless. Key decisions include the contract period, where you can sign up for two or three years and keep your introductory discount. For example, Basic would cost £132 ($161) plus VAT with the first year monthly payments and two annual bills, but only £108 ($132) if you pay the full price upfront. 1&1 IONOS also offers multiple add-ons – security, SEO, an extended website builder, basic eShop – with free 30-day trials. Choose your preferred products and the company asks for detailed billing information, including your name, physical and email addresses and phone number. After payment, an email arrives with confirmation and a copy of 1&1 IONOS' mammoth terms and conditions (almost 5,000 words). Meanwhile the website redirects you to your 1&1 Control Panel, where you're able to view and manage your account. All 1&1 IONOS hosting accounts come with access to the 1&1 Website Builder, a simple web-based site creator. Choose from an array of bundled site templates, customise the content, and drag-and-drop to add image galleries, YouTube videos, Facebook or Twitter feeds, downloads, forms, and comment boxes. We found this easy-to-use, but the templates were a little dated and the standard service limits you to just five pages. Upgrading to 1&1 Website Builder Plus enables the creation of sites of up to 500 pages, gives you direct HTML/CSS access, more web app integration and use of a royalty-free image archive, but it'll cost you another £5 ($6.10) a month plus VAT. Another option is to install a CMS from the 1&1 App Centre. The company has worked to make this much easier than the usual methods – enter your site title, a few clicks and you're done – although basic hosting users must sort out themes, extensions and updates on their own. Support is a key element of any good web host, as even experts are likely to have issues when setting up their site. There's no way we can get a complete picture of a host's support abilities with a one-off test, but we sample the service anyway to see how it performs for us. We wanted to know where we could download the free NetObjects Fusion 1&1 Edition web designer included with our hosting, for instance. A quick search of 1&1 IONOS' online database led us to download instructions, but they were useless, pointing us to a section of the 1&1 Control Panel which no longer exists. How old was that page? There's no way to tell, as unlike other services there's no ‘created’ or ‘last reviewed’ date available. While running tests we discovered that our server was using OpenSSL 1.0.1t, a relatively old version with security (and other) issues. Does 1&1 IONOS have a timescale for it to be updated, we wondered? We decided to put this question to the company's support system. Searching the Help site gave us only one hit on OpenSSL: a three-year-old article on the Heartbleed bug. The Help pages suggested we called the company instead. We did – we sat on hold for 15 minutes – we gave up. We tried creating an appointment for a support agent to call us. We had a 10:00-10:30 slot and received our call at 10:03. The agent was polite, but didn't seem to know what our question was going to be, even though we'd entered it when setting up the appointment. They also didn't display any technical knowledge, and apparently just searched their own database for any references, before giving up and saying they had no information. We decided to live with OpenSSL as it was, set up a couple of test sites, and moved on to our performance checks. Bitcatcha's multi-site Server Speed Checker scored us somewhere between C+ (slightly above average) and D+ (slightly below). Our other tests returned below average results, with for example WebPageTest recording around a 0.275s wait for the ‘first byte’. Real-world testing showed no noticeable issues, though, and overall performance was acceptable for a baseline account (upgrading should get you more speed). If the service doesn't work for you, there's a web option to begin the cancellation process, and this even alerts you if you're still within the 30-day money-back guarantee period. The downside is that you must still call 1&1 IONOS to ‘activate’ cancellation. But this was a hassle-free experience for us: an 0800 number to call, it was answered in seconds, and although the agent warned us that cancellation would mean losing all our website data, he didn't demand explanations or try to change our mind. 1&1 IONOS has great value plans for first-time users and plenty of more powerful products for everyone else, but unimpressive support might be an issue if you run into real difficulties.